But developers, energy giants SSE, said these concerns were being addressed. Campaigners claim no one is thinking through the consequences on the rural Highlands, and particularly the A82, if the 600MW project at Corie Glas – a development bigger than Cruachan – is approved by the Scottish Government next year. 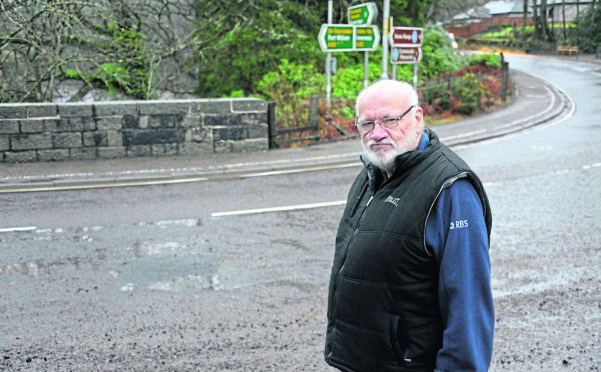 John Fortheringham, of Spean Bridge Community Council, said there will be at least 3.9million tonnes of rock taken out of the hillside to allow the hydro scheme to go ahead. Yet, he claims, no one has addressed the already crumbling roads, the effects on tourism or the number of large lorry movements that will be required to create space inside the mountain. Councillors at Highland Council’s south planning committee have already approved the development but, because of the size and scale of the project, the final decision sits with the Scottish Government. Mr Fortheringham said: “Not only do we have narrow roads that do not allow two HGVs to pass each other on the roadside, the roads are crumbling. “Is someone thinking about the road? Is anyone thinking that it might need upgraded before any planning permission is granted? “What we are worried about is the number of HGV movements that will come out the hillside. The developers will have three choices – take it through Inverness, up to Kyle or down to Corpach. “Well there is no way the councillors in Inverness will want an extra thousand lorry loads through the city. An SSE spokeswoman said: “It is important for SSE to mitigate the impact on the communities surrounding our projects. Since submitting the planning application we have entered into a Memorandum of Understanding with Scottish Canal to utilise the canal during the construction of the project including the rock disposal, reducing the volume rock to be moved by road.